ImageSkill is pleased to announce version 1.5 of Magic Denoiser plug-in for Windows with an improved interface allowing users to adjust, if necessary, the automatic noise filtering result by changing the size and location of the noise pattern and the strength of the noise suppression. Besides, new to version 1.5 the speckle removing option was added. Using the original software architecture Magic Denoiser cleans up noise nearly automatically and instantly keeping various image features and fine details unchanged. It is indispensable in the case of low size of digital camera sensor, high ISO setting and long exposures. The plug-in is very useful for the noise reduction of a series of image shots, especially when the fixed ISO camera setting and exposure time produced nearly the same noise appearance in each photo. ImageSkill Magic Denoiser is compatible with Adobe Photoshop and Photoshop Elements, Macromedia Fireworks, Corel (Jasc) Paint Shop Pro, Corel Painter, Corel Photo-Paint and Microsoft Digital Image Suite. 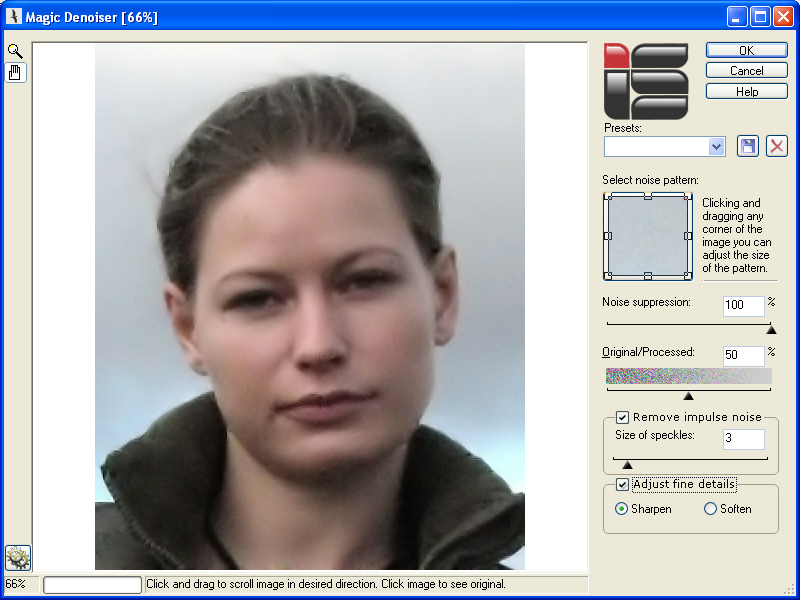 ImageSkill Magic Denoiser runs on Microsoft Windows 98/ME/2000/2004/XP/NT3/NT4/Vista. The full version of ImageSkill Magic Denoiser is available in English for $29.95 including VAT. NOTE TO EDITORS: A free registration key for a review is available upon request. Contact Dmitry Chernichenko at DChernichenko (at) imageskill.com for more information. Our team works in the image processing area since 1998 year. Over the last seven years we have worked for the JASC Software Inc., specializing in creation of photo-editing software. (In 2004 JASC was acquired by Corel Corporation). We took an active and very productive part in developing of the last four versions of their software (JASC Paint Shop Pro 7, 8, 9, Corel Paint Shop Pro X). Also we have developed image enhancement tools for LG Electronics. Recently we started the selling of our products under ImageSkill trademark. A free registration key for a review is available upon request. Contact Dmitry Chernichenko for more information or to request a registration key or marketing materials. Copyright © 2006 ImageSkill. All rights reserved. Partners.